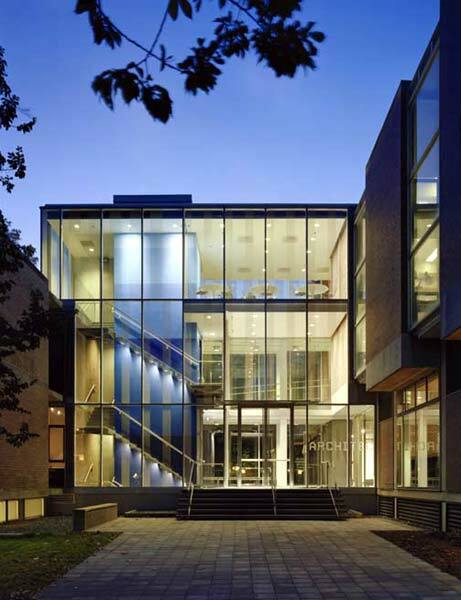 Princeton, New Jersey: A contemporary connection revitalizes two wings of an existing campus building. In February, Princeton University unveiled its “Princeton Campus Plan: The Next Ten Years and Beyond,” considered by the university to be the most comprehensive plan in its 262-year history. In the works for well over two years by a consultant team headed by Beyer Blinder Belle Architects & Planners, the plan incorporates a number of new buildings including: Whitman College by Demetri Porphyrios (2007); Peter B. Lewis Science Library by Frank Gehry (2008); Operations Research and Financial Engineering (ORFE) and Center for Information Technology Policy (ITP) building by Frederick Fisher and Partners (2008); Butler College by Pei Cobb Freed & Partners (2009); and an as-yet-unnamed chemistry building by Hopkins Architects/Payette Associates (2010). Now, recently added to the mix will be new buildings by Steven Holl Architects for an arts and transit neighborhood. 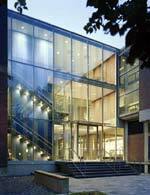 Meanwhile, a small, very thoughtful work of architecture opened its doors in fall 2007: an addition to Princeton’s School of Architecture, designed by New York City-based Architecture Research Office (ARO). 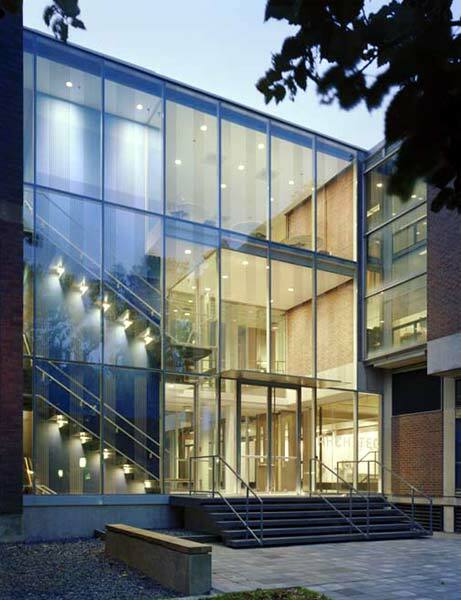 Like Pratt Institute’s Higgins Hall center section (Steven Holl Architects/Rogers Marvel Architects, 2005) and the Juliana Curran Terian Pratt Pavilion (hanrahanMeyers architects, 2006), the Princeton addition is a modern insertion between two existing buildings. 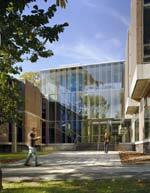 Nicknamed the “Hyphen” by students, the 2,000-square-foot addition links the two-story south wing, where administrative offices and library are located, to the three-story north wing’s studios and classrooms. 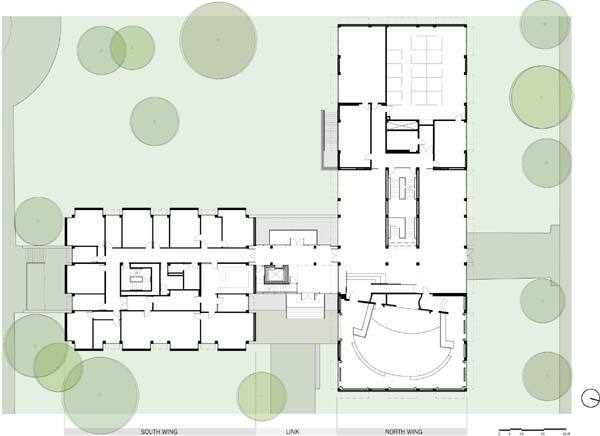 Added public spaces include a double-height lobby and a student lounge on the third floor that is literally suspended from the roof the existing building. 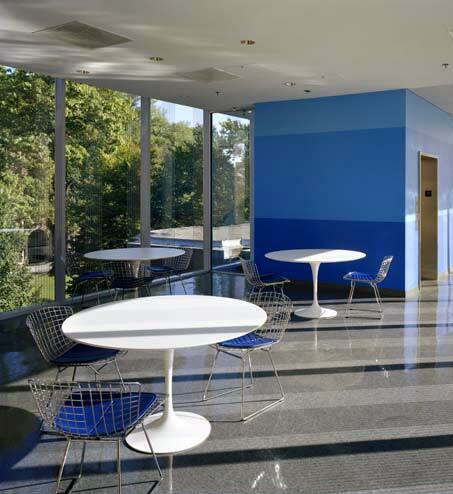 Both create informal gathering spaces for both students and faculty. And a new elevator and staircase now connect the previously isolated program elements. 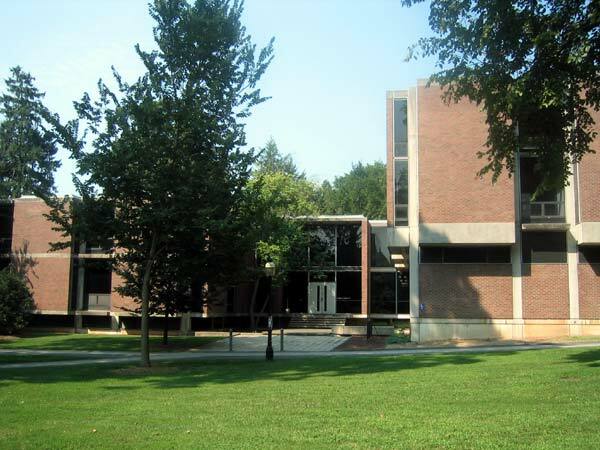 The existing School of Architecture building, designed by Fisher, Nes, Campbell & Associates, was constructed in 1963. 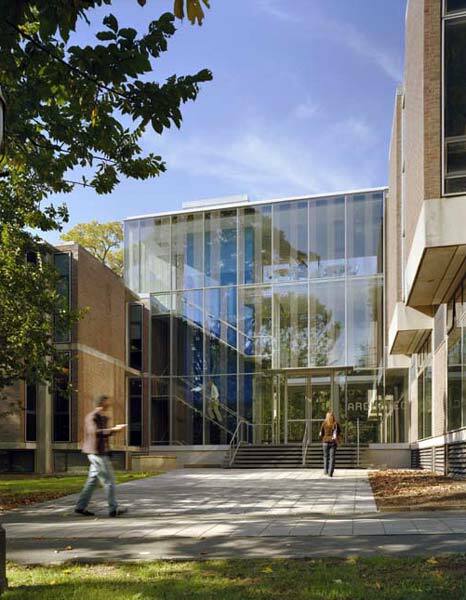 Though its organization of program is no longer effective and the narrow window bays of dark glass and wide expanses of brick exterior no longer match the desired character for the campus, the design for the addition engages and activates the existing architecture. 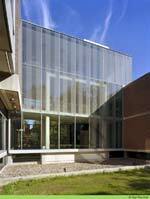 The new building’s envelope is a transparent curtain wall of large glass panels and a delicate steel frame, which ties activity within to the larger university campus outside. Plan and section take their dimensions from the original building. 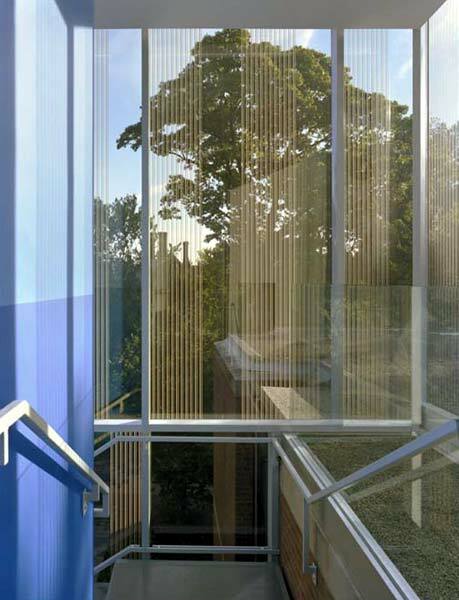 The addition aligns with the existing floor levels and, on the exterior, ceramic frit patterns translate the rhythm of the existing building’s window bays. Portions of the existing architecture are also enclosed within the addition: the brick walls, the south wing’s roof, and even the concrete structure for the original link between the north and south wings. 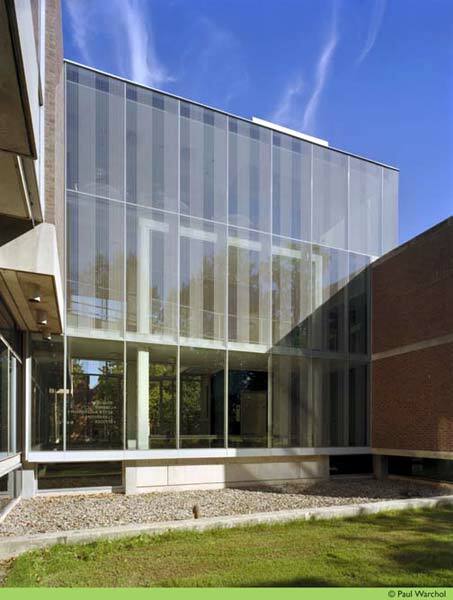 A light gray ceramic frit on the low-iron, insulated glass façade connects the new building with formal characteristics, specifically, the window bays of the 1963 building. 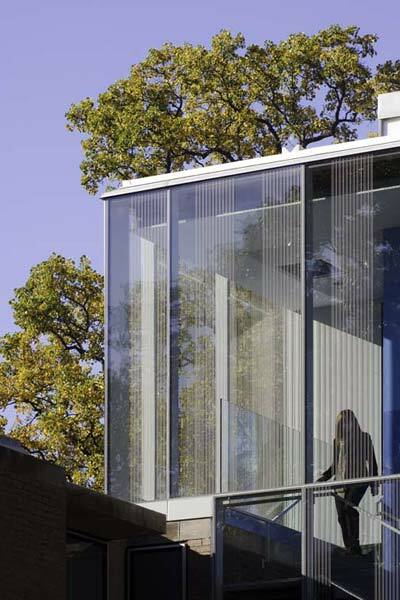 The variable patterns of the ceramic frit help to adjust the curtain wall to human scale while also mediating views and creating solar shading, especially for the student lounge. 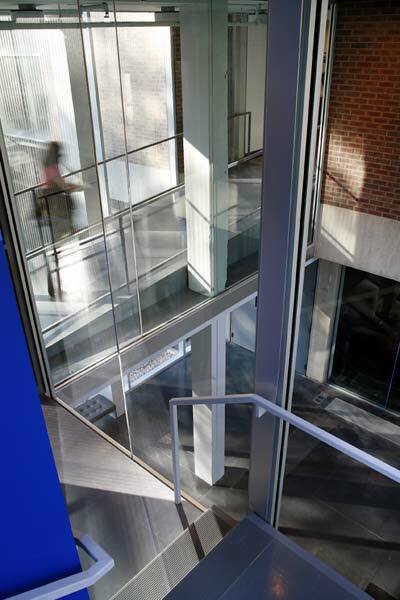 The addition’s most prominent elements are the elevator shaft, which is painted shades of blue that gradually lighten as they ascend, and a folded steel staircase that wraps around and is cantilevered from the elevator shaft. The project’s scope included 6,000 square feet of renovations throughout the existing building and a re-organization of program to create a new model shop, computer lab, and facilities for three-dimensional printing. 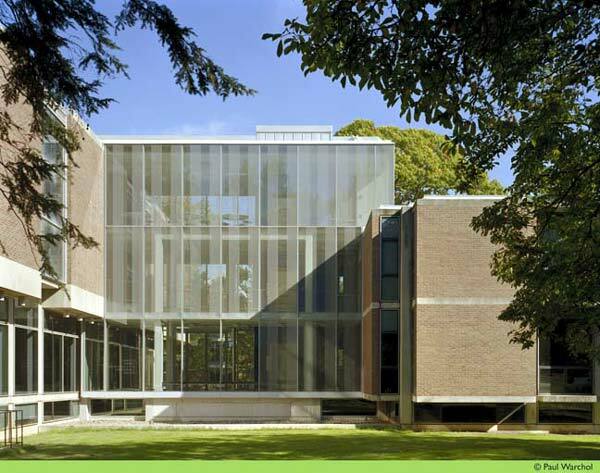 Though small in scale, the Princeton School of Architecture addition proves in a big way that older institutional buildings can be reanimated to meet today’s needs through creative design. 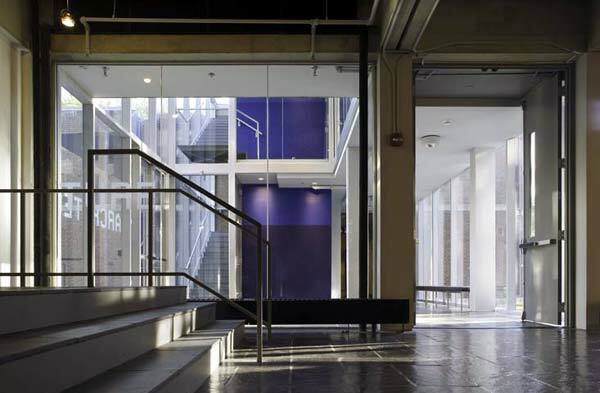 Architecture Research Office was established by Stephen Cassell, AIA, and Adam Yarinsky, FAIA, in 1993. The firm has been named a Finalist for the National Design Award for Architecture and has received numerous awards from the AIA as well as the American Architecture Award and an Artist’s Fellowship from the New York Foundation for the Arts. Recent projects include the Friedman Study Center at Brown University and a residence at Martha’s Vineyard. Notable projects now underway include the reinvention of New York City’s Union Square Park North, and the Donald Judd Home + Studio museum. A selection of the firm’s previous work appears in ARO: Architecture Research Office (Princeton Architectural Press, 2003). The new entry to the school opens into a two-story lobby. The glass curtain wall reveals activity within and reflects the Princeton campus landscape. A folded steel staircase is cantilevered from the new elevator shaft and illuminated underneath. Lighting details both new and original elements, such as the 1963 brick façade incorporated within the lobby and student lounge. View of the second-story landing from the quadrangle below. The frit pattern facing the quadrangle is less dense to permit greater transparency. View into the addition’s lobby from the north wing. 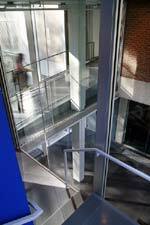 The addition’s second floor walkway between the studios and the library, seen from the stairs leading up to the student lounge. Frit on the east façade catches southern light in the early morning. The west elevation shows the concrete structure of the original 1963 building (painted white) enclosed within the addition. The curtain wall frit is denser on the west façade to shade against bright light from the afternoon and setting sun. 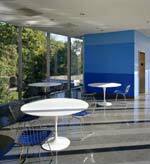 The third floor lounge, furnished with Bertoia chairs and Saarinen tables and campus views from three sides, adjoins the studios.